No description for this book. But to find a list of the poems in this collection, they are listed on the Goodreads page. This was the first time I’ve read poetry from Regina Puckett, but I don’t think it’ll be my last. This collection contains a variety of poems that all follow a similar rhyme scheme and length that made it flow nicely from one poem to the next. At times the rhyming worked great, though I’d have liked a little variety at times (I’m not a huge fan of straight-up rhyme in poetry, so this is just personal taste). The poem covered a few different topics, but there was an overall positive, almost inspirational theme to them that gave a nice feel to it, as a whole. It’s great for readers who enjoy short poems that get to the point, having just a hint of something bigger that makes multiple readings that much more enjoyable. I’d also like to make mention that I both read this collection and listened to the audiobook of it. Hearing the narrator read the poems, and comparing them to the way I read them, allowed me to see a few different interpretations to various aspects of the poems. The narrators accent also made for an interesting reading. Regina lives in Tennessee. She has been a writer for as long as she can remember. The only way she knows to shut the voices up is to tell their stories and to let them live among the pages of her books. She loves writing in many different genres because life is too short to be stuck in a rut. 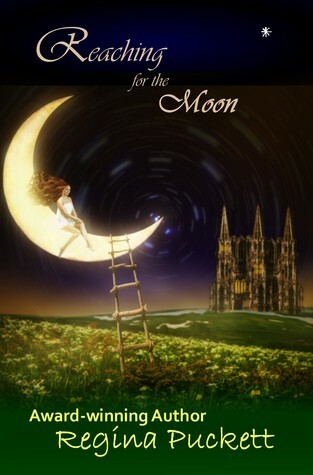 This entry was posted in Review and tagged Audiobook, Collection, Inspirational, Moon, poem, poems, Poet, poetry, poetry collection, positive, Reaching for the Moon, Regina Puckett, Review, Rhyme. Bookmark the permalink.